The E. Emerson Tool Company XSP All-in-One 9 x 12" Saw Plate lets you keep your cuts straight and true, doing away with the splintering and mistakes that can happen with free hand cuts. Just lock it into a T-track for a secure fit, and rest assured that the HDPE construction has produced a strong, durable plate. 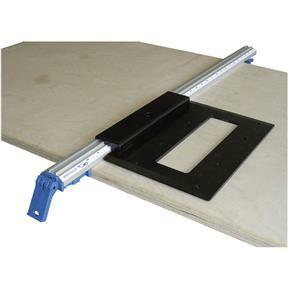 Saw Plate tracks along the All-In-One Straight Edge Clamp (T20954-57) for a smooth, controlled cut with your circular saw. Saw Plate rail fits over raised T-track on the A, Twin, and Ultra series clamps. Fits most circular saws with up to a 7-1/4" blade. Opening in plate allows blade guard on saw to function for safe operation. Zero clearance minimizes splintering. Fits T20954-57 Straight Edge Clamps.